I’ve never been to New Orleans before, but I don’t think that matters. This isn’t a post about Treme being a great show because it transports you to New Orleans; that it makes the city real to you no matter if you’ve never been there in your life or if you live far away. Ulysses never made me feel like I was in Dublin even though I lived there—Ulysses made me feel like I was living life, living in the world. I think of Ulysses when I walk around New York and smell urine or garbage or notice the sunlight early on a June morning. Ulysses’ success lies in its baroque representation of real life—so baroque that it at turns becomes absurd; creating a kaleidoscope of reality that echoes our own true experience of the world. To me, Treme does the same thing. When I watched the first season of Treme, I was struck most by its slow, Joycean pace, as well as the Mardi Gras episode “All On a Mardis Gras Day,” which reminded me very much of the “Wandering Rocks” episode of Ulysses. Now, its easy to draw parallels because both “All On a Mardis Gras Day” and “Wandering Rocks” create a representation of a city in the middle of a procession, of some kind of ceremony and all of the individual lives that occur in and around that event. But that is what is so vial about both. 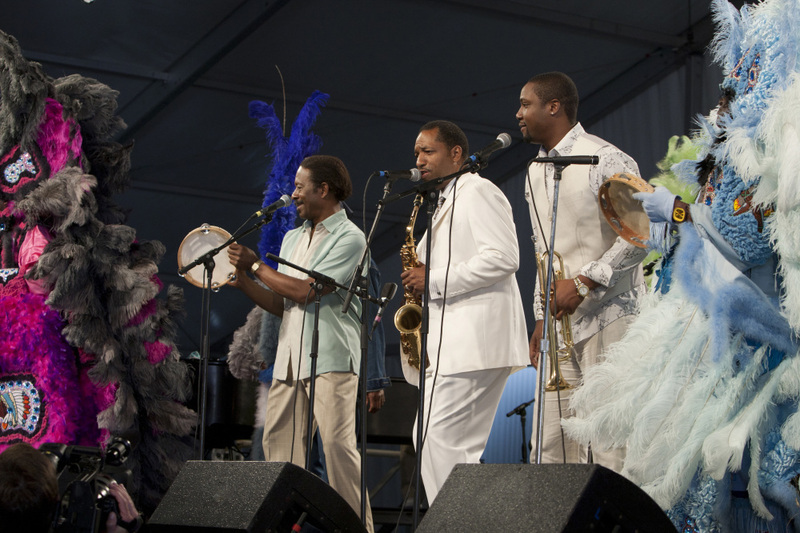 Both Treme and Ulysses capture cities—two very different cities—but in that capturing, they relay greater overall truths about human existence. The setting doesn’t necessarily matter in the end. Many people who liked The Wire don’t like Treme. Now, one of the cardinal sins I have committed in my life is the fact that I have never watched The Wire. It is my ultimate “I should do that” object or experience; that movie, book, place you always can agree with people about being great through general cultural knowledge, but never actually force yourself to do alone. Everyone has one. People loved The Wire and from what I’ve heard and read, rightly so. All fans of The Wire and David Simon in some way wanted Treme to be The Wire: New Orleans. However, Treme is not The Wire. They each share a sort of Tolstoyan scope and attention to action—they both depict people and the decisions they make in complete objectivity as objects in relation to other objects and allow the action and drama to come through that juxtaposition, relief and repose. Treme seamlessly moves to the different sections of New Orleans life as I am told The Wire did for Baltimore life, or as Tolstoy did for Russian life. It would seem that the whole point of Treme would be to depict and tell the story of post-Katrina New Orleans, and that is certainly the case on one level. However, I firmly believe that Treme is just the story of people’s regardless of the city. Sure it is drenched heavily in the color and music of New Orleans, but sometimes to tell the actual story, you need to make sure your scenes are full—that they smell and sound real and are anchored in something or someplace tangible. Even though Treme is filled with characters that are musicians and countless scenes revolve around gigs and street-side jam sessions, it is not a show simply about music. You need to look no further than the last scene of the Season 2 finale. Season 2 was better than Season 1. Season 2 ended with a montage of the characters in the show. It just showed them in motion, in places their actions had taken them due to the course of the season/their life. As a viewer, only we know of any progress or regression that has taken place. Take, for instance, my second favorite storyline of the season. Sonny, a Dutch musician transplanted in New Orleans, has lost his girlfriend (the very talented violin player, Annie T) and has bottomed out as a heroin addict. Through the course of the season he gradually finds a steady gig as a guitar player in a band and is helped to get sober by one of his bandmates that makes him work on an oyster boat. It is through this that he is eventually put in the position to ask out the daughter of a local Vietnamese shrimp fisherman/fish salesman. Why is this one of my two favorite storylines from the season? First, I always enjoy a story about personal betterment. I get a certain validation from someone cleansing himself or herself, perhaps because I am always trying to cleanse myself of any baggage that I might be carrying, whether literal or cosmic. The other reason is because just look at the action of that plot progression. Based on the actual episodes and events of the show, it would seem like nothing happened. Yet, when you show a snapshot of that character and where he is at the present moment, nearly everything has happened. He has gotten over his heroin addiction. He has joined a band and even if the band did break up, he is no longer only known as a street musician. He has made small strides through the everyday. He has taken action and thus his life has changed. It is not some terrific advancement or achievement, but it does mean something—it does matter and tell us about what we are all capable of. We are all capable of change and change comes often at the smallest and most incremental levels. When you pay attention to those changes in a snapshot, you often learn more than you expected. My other favorite story revolved around Delmond Lambreaux and his father Albert “Big Chief” Lambreaux. Delmond and Albert have a strained relationship because Delmond chose to become a musician in New York rather than New Orleans, where Albert is respected as an Indian chief and community figure. Delmond wants Albert to move out of the family home or at least accept money to help repair it, but Albert is stubborn and the two clash constantly. This season, Albert comes to New York because Delmond wants Albert to help him on his new record, a record about his New Orleans roots. Albert finds plenty to criticize about New York, especially the bead store where Delmond goes to get beads to sew his own Indian suit for Mardis Gras. Albert begins to criticize Delmond’s sewing speed too, when Delmond explains what he is sewing is for his father’s suit. He explains the image he is sewing is a depiction of his father and his sadness over what has happened in his life. The two share a quiet moment where Albert tells him that the sewing work isn’t bad. You see that Delmond takes the modest compliment as something with greater meaning, which it most certainly is coming from Albert. In the season finale, the two perform a song from Delmond’s album at jazz fest. Both men are onstage enjoying the moment and enjoying being together. This is a journey of a father and son. As far as action goes, nothing huge happens to them in two seasons. Delmond visits New Orleans often. Albert reluctantly comes to New York. They both bicker and fight over who is more stubborn. However, their lives are punctuated by these moments and these small moments make the whole difference, they create the meaning. Treme is certainly about New Orleans. It is about terrible events that happen in our life. It is about death and destruction and what we do to overcome those things. Mainly, though, it is about small moments. It is about how we progress with our lives despite the fact that people are murdered or hurricanes or tsunamis destroy our cities. No matter what happens our individual lives and existences carry on in the face of mass tragedy and the uncaring nature of the universe. There is something to the progress and improvement we make. There is something to the roles we take on and shed in our lives. Our personal stories matter as do the places our lives take us to, whether it is a New York kitchen, San Francisco, a stage with our father, a shrimp boat, Kenya, Minnesota, a coffee shop writing songs, the classroom of a school, or back behind our family run bar. Small changes are what matter and very often those are made at a slow pace. Appreciating that pace is important, though. And that’s why Treme is a show I watch. As a viewer of both Treme and the Wire, I will admit that I was a little disappointed in Treme at first. Like The Wire, Treme is slow-paced, and I knew David Simon liked to build The Wire's seasons to a climax by about episode 10. Well, that never really happened in Treme, which speaks to its unique strengths that you've described (magnifying small changes in normal people's lives,) and to the main difference between Treme and The Wire. Like Treme, The Wire focuses on a tapestry of normal citizens (cops, dealers, junkies, students, government.) The main difference is that each season had a grand narrative binding most of them together, the cops dealing with changes in politics, the dealers responding to the cops, etc. In creating this narrative, Simon elevates these bit players into mythological status, as actions from season one echo through the other four. The writing staff for the Wire was mostly crime novelists, and it shows. Treme strikes me less as a 'novel on the screen' than an attempt to bring real life to the screen. There often is no apparent narrative to life but the small changes, and the myths we make are of similarly minor things (the immense musical heritage of N.O. notwithstanding.) The Wire created its own mythology, which makes it hard for people to not talk about it with other people. I now love Treme, but I don't have the same desire to 'share the myths,' as only Treme could document those so minor, if they exist at all. Erik, you make a great point here about mythology and why people feel the need to talk about The Wire. This is something I probably would have picked up on if I actually watched the show. I still need to, but now I will think of mythology like you say. Thanks for this. Damn you, Gundel! Your eloquent post made me confuse you for a stranger. Haha sorry/ thanks. I was mostly trying to work this out for myself, as I've had a hard time articulating the difference between the two shows.